Niki over at Rural Writings mentioned her book. 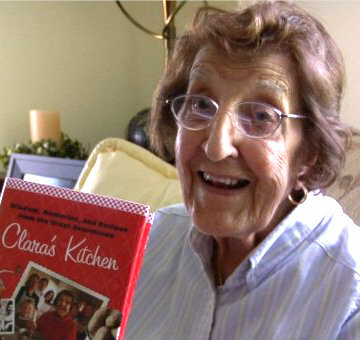 Then Nan over at Letters from a Hill Farm, wrote an enthusiastic piece about her, including a recipe as well as a video. I am always interested in reading books about the depression era, finding them full of practical wisdom, where families learned to be creative and resourceful as they persevered through a difficult time. When this book was mentioned, I went right to my library website, saw that we carried it, and placed my hold. The book arrived at the library today and is just what I hoped it would be. Although it is small in size, with only 194 pages, this book is compact and filled with personal stories, recipes and photos of food, family and friends. 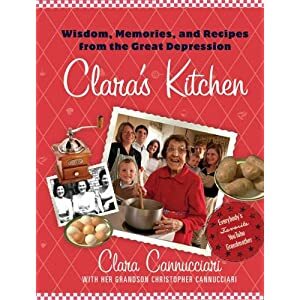 Meet 94 year old Clara Cannucciari, who along with her grandson Christopher, created this wonderful book as well as the video series and her website which you can find here. I just couldn't resist sharing these videos with you as she is just so cute and so practical. You can find more of her video series on youtube. You need to watch her dandelion salad video and see how God provided for her family during the poorest of times as she talks about the common weed and food from heaven.